Remember when you were in school and you sat for most of the day, listening to teachers talk? I used to go to the restroom during class just to have a reason to move around. Obviously, as teachers, we want our students focused, we want them listening and participating, and we don’t want them leaving for the restroom just so they can move around. 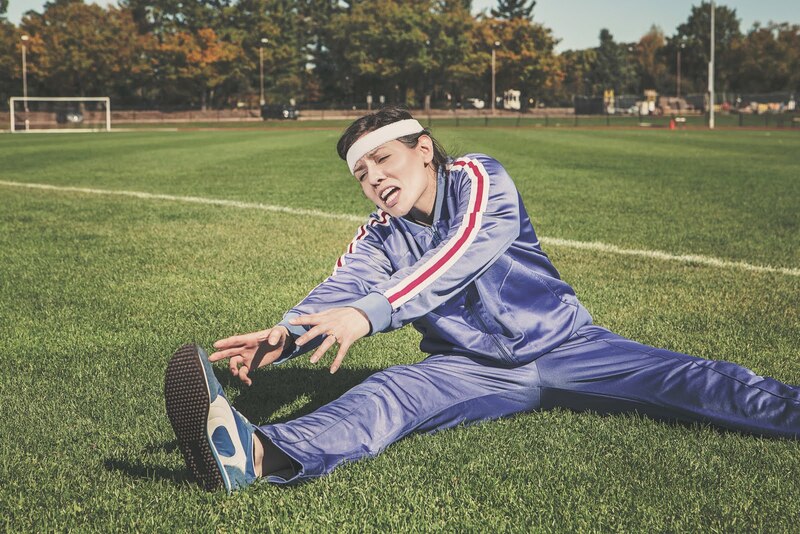 Younger kids have recess, and we know that helps, but what about our secondary students? Can we really expect them to sit still most of the day? 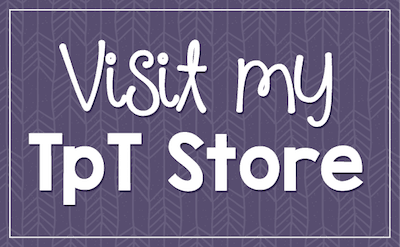 Keep reading for some ideas for incorporating more movement into your classroom! Movement is so important for learning. It increases blood flow and oxygen to the brain, helps them maintain focus, and decreases incidences of behavior that are usually related to boredom or a child’s inability to sit still for one more minute. 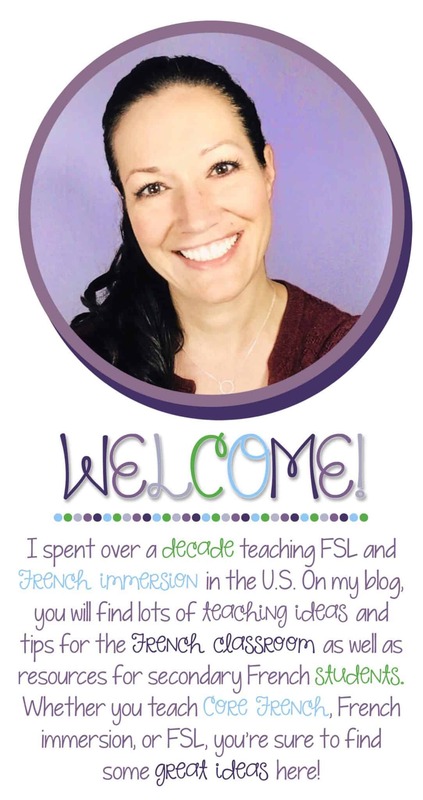 Fortunately for foreign language teachers, there are so many ways to bring movement into your classroom with little or no preparation on your part. It does mean that you have to be ready for movement and noise, but I promise that once you get used to students moving around, you’ll wonder why you had them sitting so much in the first place! Here are some easy ways to bring movement into your classroom. Foreign language is a class that is perfectly geared for this type of movement. Are your students learning food vocabulary? Have them role-play waiter and customer. Are you teaching the subjunctive? Students can play the role of parent and child or teacher and child. There are endless ways to role play in a foreign language class! Get some cheap blow up balls or even small stress balls. Divide your class so that you have groups of about 6-8 students per group. Give each group a ball, have them form a circle, and do your practice drills out loud. If you are teaching verb conjugations, you can call out or project on your screen the subject and verb and have the student with the ball conjugate the verb. He/she then throws the ball to another player in the group and play continues. Learning vocabulary? 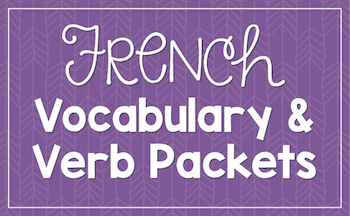 Call out vocabulary words and have students give the French equivalent. You can even ask the students who answer to give the next question. It is so much fun, and because throwing things in class is usually a big no-no, students LOVE it! Call out verbs and have students act out the verb. For example, when you say “courir,” students run in place. When you say “manger,” students pretend to eat. My students love this one! Write your vocabulary words on cards and have students act them out. It’s quick, simple, fun, and requires a very minimal amount of preparation on your part. Up the stakes and make it a competition between teams. This is particularly fun when doing units with a lot of new verbs. This is not just for little ones, but unfortunately, a lot of secondary classrooms don’t feature these. They are more work, and when we are busy, a printed study guide is so much easier than various learning stations. What if you made your test review in stations? You could still take the same study guide, but instead of printing a five-page document that students may or may not finish, you could print strips with the most important questions (I sometimes just write them on index cards), post them on your wall, and have students walk around the room with a partner, answering the questions. This one depends on the size of your room, but I have had some small classrooms where I can still get 20 questions on the wall. You can have them write in their notebooks or give them specific papers, but the point is that they move from question to question and keep focused. My students LOVE it when they come in and see the cards on the walls. Really, it is the same study guide that I would have given, but I have just found a way to make it fun! Students review and they get the much needed movement as they go from question to question in your classroom. 6. Stand up and stretch. Take two minutes at the beginning of class to help kids reset. I do it right at the bell, before most students have done their bellwork. We stand up, stretch our arms to the ceiling, lean left, lean right, touch our toes (if we can! ), stand back up and lean back, stand up straight and twist left, then twist right. You can do more if you want, but this is often enough to get the class focused and ready to work. I also love neck circles for afternoon classes, because it really helps that shoulder tension from sitting all day. 7. Use structured activities geared towards movement. These speaking cards are perfect for secondary students who need to move! There are a number of fun activities that you can do with these cards, but here is my favorite. 1. Print off the cards and give one to each student. There are 32 cards, so chances are, you won’t use them all. Just pass out the cards that best match your vocabulary. 2. Give each student a question and have them read it for comprehension. Have students form 2 circles, one inside of the other. Each student should have a partner. The inside circle faces the outer circle. (If you have an odd number, just substitute someone in each time and have the odd student out help other students.) The students from the inside circle ask their questions first. Their partner responds, then asks his/her questions. When all pairs have finished, the outside circle moves one partner to the right. Continue until all questions have been asked. 3. When you collect the speaking cards, you can have students return to their seats and you can formatively assess them by calling out random questions. 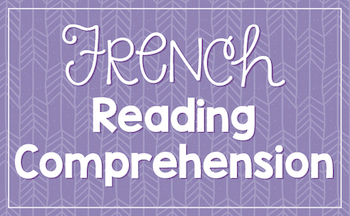 Click here to see these passé composé speaking cards. 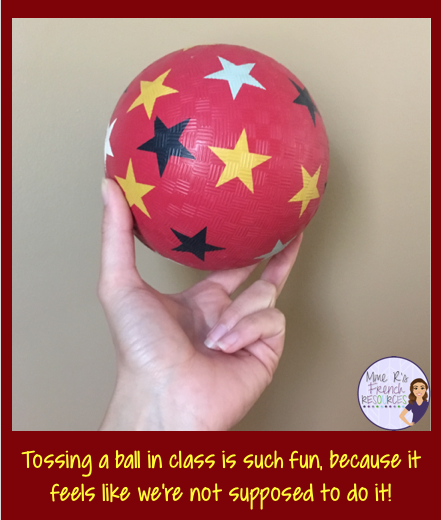 This activity is a lot of fun and will encourage a lot of movement in your classroom! 1. Give each student an answer sheet. 2. On each desk, tape one question. Tape them in order, so when students move from question 1, they will go to question 2. 3. Students start with the question on their desks and then progress to the next question. So, a student sitting at desk 10 would start with that question, then move to question 11. 5. I normally do 20 questions at a time, because I think this is about the amount of time my students like to play. This activity comes with 40 questions, so you can do two rounds or you can play on two separate days. The extra questions are great for a learning station or as bell works if you don’t think you’ll play twice. Read more about these task cards here. 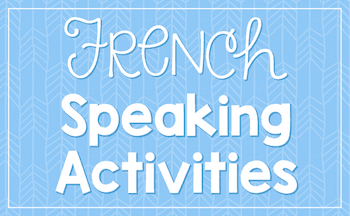 Click here to see these avoir and être task cards. This is another favorite in way to get some movement in my classroom. 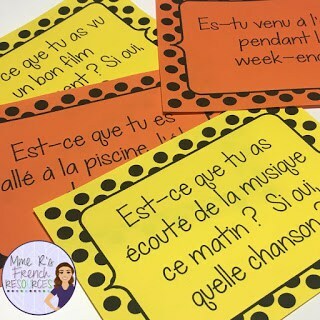 Students get to move around and ask questions in French, so it perfectly aligns to your standards and incorporates the movement that is so crucial! Plus, because they are not speaking in front of the class, it is less intimidating for your shy students. 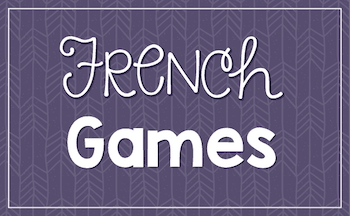 This activity is perfect for any level of French, but I love it for beginners who really need the extra push to speak French! 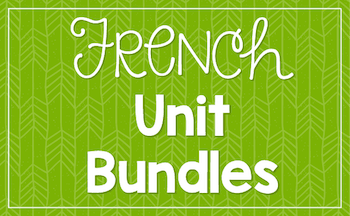 This bundle contains the beginning topics for a French 1 curriculum. 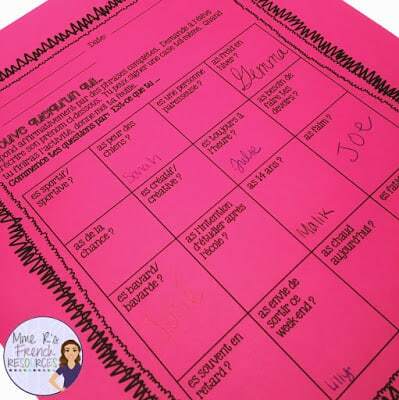 After each activity, there is a sheet with the same questions that can be used as a follow-up homework or even as a speaking assessment! Includes rubrics to simplify the job for teachers. Click here to see all my Find Someone Who… activities. What do you think? Why is movement so critical in the classroom and what great ideas do you have to get students moving? Please post them below! These are such great ideas, especially the ball toss. And they can be translated into ELA too! I love these ideas!!! Thanks for sharing!!! For 9th grade ELA I gave students a literary terms matrix that required them to full in the definitions. I put two or three definitions at each station and had students circulate the room to find the definitions. I had terms on one side of a 3×5 card and definitions on the other. It kept the students active and gave me opportunity to interact one on one with them rather than just give notes. 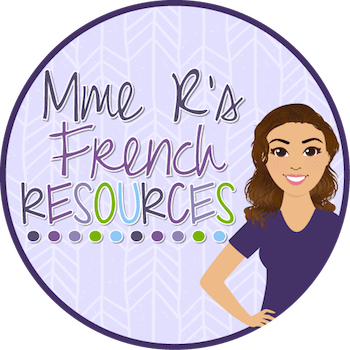 Really helpful and fun ideas for someone like me returning to the French classroom after several years. Can't wait to try these activities.